Up to Six-Phase Input in One Unit. Synchronized Measurements between two units simplifies your processes. A single WT1600 unit can make up to six different power measurements (six input each for voltage and current). With the measure start-stop function (synchronized measurement), two WT1600 units (12 inputs) can be synchronized. The WT1600 has two different input elements. A 5 A input element is provided for measuring extremely small currents, while a 50 A input element serves to measure large currents. Both of the elements can be installed together in the WT1600. The current for the 5 A input element can be set as low as 10 mA for measuring extremely small currents in energy-saving equipment. Measurement of rapidly fluctuating secondary voltage and lamp current when a light is turned on. The WT1600 has a higher measurement accuracy than any instrument in its class. It also features a 1 MHz measurement bandwidth (voltage, current) effective for such things as the evaluation of high-frequency illumination devices using inverters. In addition to numerical data, the WT1600 can display input signal waveforms. Eleven different display formats can be selected on a single WT1600 unit, so it is not necessary to connect an external waveform viewer to check waveforms. The WT1600 displays measurements for each display updating interval in a time series. The time axis (T/div) can be set in the range of 3 seconds to 24 hours (wave off). Changes in up to 16 different parameters, such as voltage, current, active power, and apparent power, can be observed simultaneously in long-term continuous tests. The diagram shows the effective input measurement range (AC voltage and AC current from 1% to 110%) at which accuracy is assured, by range-value rating. When using a 1 A range-value, accuracy is assured down to 10 mA. Also, DC voltage and DC current have assured accuracy from 0% to 100%. Since the voltage and current ranges are fixed during the integration mode, the WT1600's assured accuracy over a wide range makes it a very useful tool. The WT1600 stands out when it comes to measuring equipment with large input fluctuations such as intermittent control devices and copiers that can repeatedly alternate between normal operation and sleep mode. The harmonic measurements function is a standard feature on the WT1600. It is capable of measuring waveforms with a fundamental frequency ranging from 10 Hz to 1 kHz. Analysis results up to the 100th order from 50/60 Hz fundamental waves can be displayed as numerical values or bar graphs. 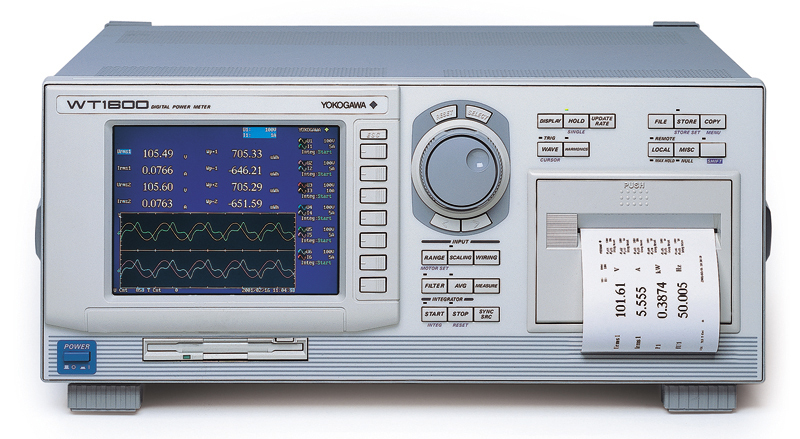 The WT1600 can display harmonic measurement result as lists, and fundamental waves as vectors. Print out screen images using the built-in printer. The printer is located on the front panel allowing you to rack-mount the instrument. You can output not only hard copies of the screen, but also numerical data, and harmonic analysis data as well. The Ethernet function allows you to use FTP server, FTP client, Network printing, Automatic Mail Transfer (SMTP), and others. The WT1600 can measure the output from a speed and torque sensor on the output of an electric motor, and calculate torque, rotating speed, mechanical power, synchronous speed, slip, motor efficiency, and total efficiency. Both analog and pulse inputs can be accepted from the sensor. In addition to numerical values, waveforms can be displayed to provide a visual picture of fluctuations in parameter values. Analog outputs are available for up to 30 measurement parameters. With the 6-element WT1600, as many as five analog outputs are available for each element. you want to efficiently save measured data and image files. of numerical values and waveforms. Input signals are sampled at high speed (approximately 200 kHz), so power can be measured even on rapidly fluctuating input signals. Integrated power can also be determined separately for each polarity. Capable of displaying an easy-to-view four-parameter display (two parameters during simultaneous display with waveforms), or increasing the number of parameters up to 78. Can be used in combination with keys next to the screen for easy operation. The rotary knob allows the user to rapidly locate the desired parameter from numerous parameters shown on the screen. Waveforms, numerical values, and screenshots can be saved to the 3.5-inch floppy drive (standard feature) or the optional internal hard drive. Settings can be saved and retrieved.